Effective leaders never blow an uncertain trumpet. It neither inspires nor encourages and only poisons the air. Better not to blow at all. Barack Obama says he wants to "degrade and destroy" the barbarians of the Islamic State, but he won't call it a war, won't necessarily fight it to a triumphant conclusion, and won't even accurately describe the enemy. The president insists that ISIS isn't even Islamic. (Presbyterians, perhaps, or Quakers?) Who would rally to a call to arms like that? Mr. Obama so far has organized only a coalition of the unwilling. Even American's usual allies are saying no thanks. Britain, the old reliable with severe problems in the kingdom, says this time it won't participate in air strikes, not even against pick-up trucks and pushcarts. Germany, sensitive to the shakes and shivers the rest of the world gets at the sight of Germans in uniform, tells Washington to include them out. France is willing, with its usual asterisks, if Iran, where the French have carefully cultivated trade ties, is allowed to join. Mr. Obama rightly regards this as a tasteless joke. Iraq is in and so are the Kurds, who might be useful, and the Syrian rebels, though it's not clear to what end. That makes it an alliance of five, not exactly the five that anyone would, in Lyndon's Johnson's felicitous phrase in another time and place, want to "go to the wall with." This is not quite the coalition that George H.W. Bush assembled in his successful campaign to retrieve Kuwait. The summer soldiers of the left accused him of "going it alone," though with a coalition of 37 countries Bush the Elder was anything but alone. Mr. Obama is the president "going it almost alone." Where, exactly, he thinks he's going is not quite clear. His trumpet sounds more like a tin horn from the toy store. He says he will "take the fight" to the barbarians most people call ISIS or ISIL, and the world can't merely "contain" but must work to dismantle ISIS. He was encouraged after meetings with NATO partners; everybody at the session in Wales agreed that barbarians are bad. Everyone, the president said, was preparing to act "with urgency." He went to Estonia where his language was more like mush than iron. Maybe the U.S. goal would be to "contain" after all. But two days later he decided that "you can't contain" ISIS, which has swallowed large patches of territory in Iraq and threatens to take more. Mr. Obama talked about his "expectation" that his campaign to get the backing of Arab states in the Middle East will be "fruitful." Having taken heat for saying earlier that he has no strategy for defeating the barbarians, he talks now of trends and phases. He first had to encourage the Iraqis to establish a government to include everybody, not merely a quarreling collection of competing tribes with flags. Then he could order the air strikes against the pick-up trucks. "The third phase," he says, "will allow us to take the fight to ISIS and broaden the effort." No one mistakes Arab big talk for anything resembling willingness to act. A State Department spokesman said Arab nations could participate in "non-lethal ways," perhaps by making reconnaissance flights when there's nobody else in the sky, or by dropping rice and beans to the hungry. Blah blah is the preferred currency in the Middle East. President Fouad Massoum of Iraq, a Kurd, regrets that Iran is not included in some of the meetings, but concedes "the sensitivities between some countries and Iran." But he doesn't want Egypt or Saudi Arabia to make any air strikes. "It is not necessary that they participate in air strikes," he says. "What is important is that they participate in the [talk]". Talk can be good, but only if backed by the certainty of action. Talk can be fatal if it is backed only by more talk. Winston Churchill recruited the English language and sent it to a war at a time when Churchill's words were the only weapons the British had. The enemy knew he meant the words. Now the world is locked in another kind of war, and America has another kind of leader. 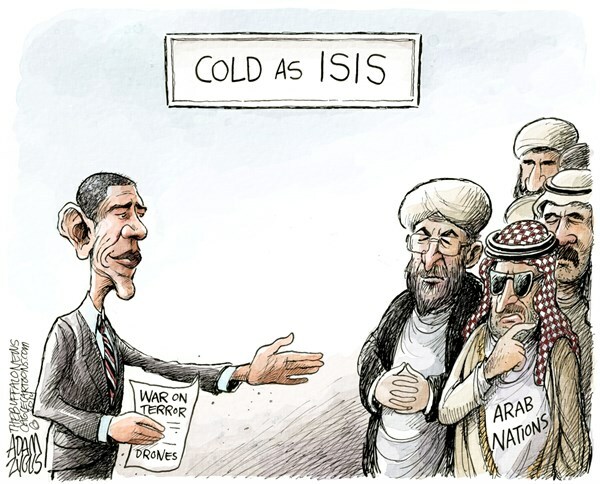 Mr. Obama never wastes an opportunity to reassure the enemy that his heart is not in the fight. "As your commander-in-chief, I will not commit you and the rest of our armed forces to fighting another war in Iraq," he told the troops at MacDill Air Force Base in Florida. A worthy aim, but no worthy commander would attempt to inspire by telling his soldiers that their war is not worth the sacrifice.